On Sunday, 28th January, Canon Alan Marley was commissioned to serve as Church of Ireland Chaplain at University College Cork. 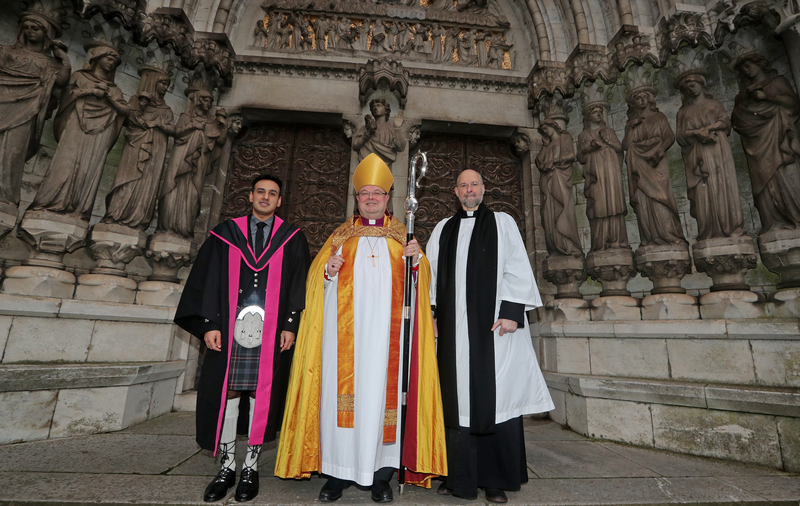 The Commissioning was held in Saint Fin Barre’s Cathedral, Cork at the start of Choral Evensong, after which Canon Marley was installed as Prebendary of Dromdaleague and Kilnaglory in the Cathedral Chapter. The Commissioning was done by the Bishop, the Right Reverend Dr Paul Colton, and, on foot of the Bishop’s mandate, the Very Reverend Nigel Dunne, installed Canon Marley in his prebendal stall. 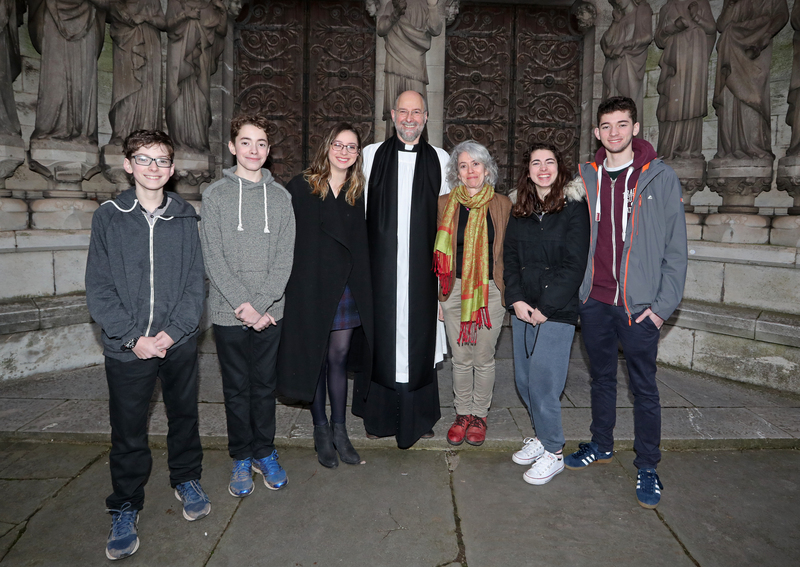 Clergy and people from throughout Cork, Cloyne and Ross, were joined by the President of University College Cork, Professor Patrick O’Shea, who led a group of academic and university staff, as well as students. The lessons were read by the President and Father Gerard Dunne, UCC Chaplain. As part of the Commissioning, symbols of the ministry of a chaplain were presented to Canon Marley by representatives of the Diocese and the University: a bible, the water of baptism, the bread and wine for celebrating the Eucharist, the oil of healing, a Book of Common Prayer, and a towel of Service. A book from the Boole Library was presented to represent study, and a hockey jersey from UCC Men’s Hockey Club was presented to denote sport and leisure. Of particular note, was a Muslim prayer mat (to represent the diversity of religious faiths in the University, and for the use of Muslim students) was presented as a gift by Dr Amanullah de Sondy, Senior Lecturer in Contemporary Islam, and Acting Head of the School of Asian Studies at the University. … it has been an exciting, and slightly bewildering, time. The move from Midleton was an enormous upheaval and Anne and I are grateful for all the help and kindness we have received in making it. The welcome of the Chaplaincy team, led by Fr. Gerard Dunne, has been one of great warmth, encouragement and openness. It has been exciting to see the ministry that exists within the University and that it is appreciated and respected. It was wonderful that the President of UCC, Professor Patrick O’Shea, and many of his colleagues from the academic staff, were able to attend and participate in the commissioning service. I hope I will be able to find my feet in the coming weeks and months, and look forward to the challenges ahead. The University is a community of thinkers, engaging in intellectual pursuits not for any external or utilitarian purpose, but as an end in itself: knowledge for knowledge’s sake. Envisaging a broad, liberal education, which teaches students ‘to think and to reason and to compare and to discriminate and to analyse’, Newman believed that narrow minds were to be avoided by exploring all areas of study. Surprisingly, some might say, Newman, once an Anglican but who became a Roman Catholic, said that the University should be a secular place, but that does not mean ‘no religion’. We value this partnership between the Diocese and University College Cork which I first negotiated 17 years ago with the then President, Professor Wrixon. We offer chaplains to the University not to change its secular status but to journey with the community that is the University, those who are religious of many outlooks, and those who are not. We believe that Alan Marley will bring many gifts and much experience, not least his own humanity to this position. We are delighted to have Canon Alan Marley as a chaplain in our University College Cork family. The Chaplaincy service at UCC is our oldest student service, and also supports our staff in a community totalling over 23,000. Along with his broad community experience he brings to UCC a vision of love, peace, and respect for all who seek support on their spiritual journey. My colleagues and I were honoured to participate in his commissioning service at St Fin Barre’s Cathedral. Fr. Gerard Dunne, O.P. 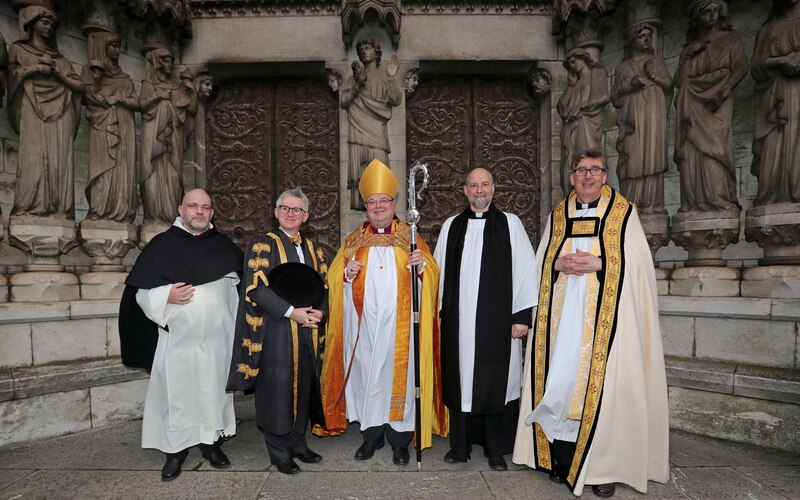 Chaplain UCC, Professor Patrick O’Shea, President UCC, The Bishop of Cork, Cloyne and Ross, The Right Reverend Dr Paul Colton, the Reverend Canon Alan Marley, and the Very Reverend Nigel Dunne, Dean of Cork, following the Commissioning. Picture: Jim Coughlan. This entry was posted in Appointments, Chaplaincies, Commissionings, Community Involvement, Education, University College Cork. Bookmark the permalink.